Incarcerated mothers and fathers face many challenges to maintain bonds with their children in the face of difficult circumstances. Limited time in prison visiting rooms is not always enough. 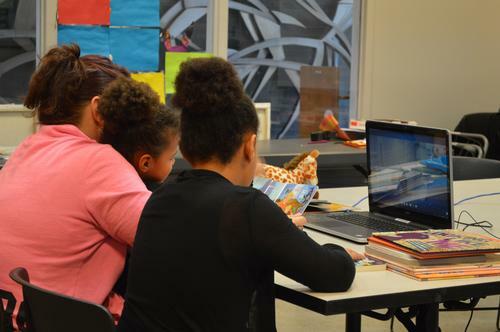 Using videoconferencing technology, the Free Library’s Stories Alive program offers an opportunity for a different kind of visit. Children come to a local library where they can see, talk to, and read with their parents. Thanks to a grant from the Institute of Museum and Library Science (IMLS), in combination with our partnership with the Philadelphia Department of Prisons (PDP), we provided this opportunity for many children this year. Many of the families returned for multiple visits. In addition, we gave away books to each child to support literacy in their homes. To encourage families to keep coming back to the library, we issued library cards to anyone who didn’t already have one. We also made library cards available to all the incarcerated parents that participated in our program, ready for them to pick up as soon as they are released. Families give us many reasons for why they value Stories Alive. Some talk about the library setting: "It allows bonding time for father and child not obtained in crowded jail visits," said one mother. Another told us, "We never get to see him all together on visits because there are 3 kids and it was nice to be in a library setting reading stories." Some of the parents haven’t seen their children in a while: "[It is good] to get to see how your kid learned how to read and how big they've gotten." Many notice that the reading aspect makes the experience unique: "This experience gives me and my kids more to do than a normal visit," said one father. "Child gets to see the parent as well as getting chance to do something constructive," said another. As I think back on the year, I am grateful for the time I have spent with these families. At one Stories Alive session, a mother came in with a very young child. He was less than two years old and I thought he might be a little young to know what to make of the sight of his father on a video screen. I didn’t need to wonder for long. He immediately said "da-da!” and reached toward the screen. The mother and father worked together to read several books with him, asking him questions about the colors, shapes, and objects he saw on the pages. When he got distracted—as any child his age would after sitting still so long—his father called his name and then slowly counted down from five. Like magic, the little boy was reading with his dad again. Another time, a mother surprised her nine-year-old daughter with a visit to the library to see her father. The child was quiet and guarded at first, I think a bit off balance because of the surprise. Her father read beautifully and expressively, talking about the stories along the way, but she didn’t join in at first. She gradually relaxed and after they had read all the books they could, they talked happily together for the rest of their time. He told her to work hard in school so she can go to college. She told him that she wants to be a dancer when she grows up. It was easy to see what a special moment this had been for the two of them. Thanks to the generosity of several private donors, we have big plans for the future. We are working with several other correctional facilities to expand our program and allow us to reach more families. In addition to the three branches that made space available to us this year, we plan to add more library locations and staff so we can hold more sessions simultaneously. We will maintain our libraries at PDP and work to expand them and open more locations. We will also update Bridges, our guide to re-entry resources. We will also be adding The Reading Based Diversion program, which is aimed toward students (ages ten and older) who are involved in low-level offenses like fighting, bullying, threats, or possession of items that could be used as weapons. The ten-week program is intended to help these students improve their reading skills. Furthermore, it will encourage discussions about characters in books who are having experiences like their own. Students will learn that their views are important and how to resolve disagreements with words rather than violence. As we wrap up our year-long pilot program, the Prison Services program would like to express our gratitude to IMLS. The Sparks! Ignition Grant they gave us made this past year possible and allowed us to help reconnect incarcerated parents with their children in a special way. Bravo to this program and all the people involved. Well done! It was extremely gratifying to read this follow-up story to the initial blog post regarding the Free Library's Stories Alive program posted in September. I was especially moved by the two first person accounts of specific encounters between incarcerated individuals and their loved ones. As a retired school teacher, I recognize that magical spark of human connection that makes our efforts at fostering literacy so worthwhile. It is good to read of your successes to date and your plans for the future. I am especially interested to learn more about how the Reading Based Diversion Program proceeds. Engaging older children in literature whereby they can relate to characters experiencing conflicts similar to their own, while at the same time helping them to boost their reading skills is a totally "RIGHT ON" terrific concept! Good Luck in 2017!